New material in this table of contents is boldfaced so that you can easily see what has been added. Topics that have been significantly expanded in the second edition are signaled with *. Some material in the Communicating Ideas section is sequenced differently in the new edition. 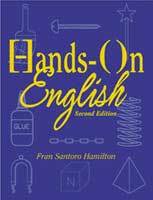 Hands-On English. Trade paperback, 192 pages, 8 x 10 1/2 inches. Illustrations, index, appendices. © 2004. ISBN: 0966486757. $14.95. Click to return to Hands-On English. The Activity Book accompanies Hands-On English and helps students master grammar and language skills.